In their tiny, sea-beaten cottage on the north coast of Scotland, Liska and Ruth await the birth of their first child. Each passes the time by telling the baby stories, trying to pass on the lessons they’ve learned: tales of circuses and stargazing, selkie fishermen and domestic werewolves, child-eating witches and broken-toothed dragons. But they must keep their storytelling a secret from one another, as they’ve agreed to only ever tell the plain truth. So to cloak their tales, Ruth tells her stories when Liska is at work, to a background of shrieking seabirds; Liska tells hers when Ruth is asleep, with the lighthouse sweeping its steady beam through the window. 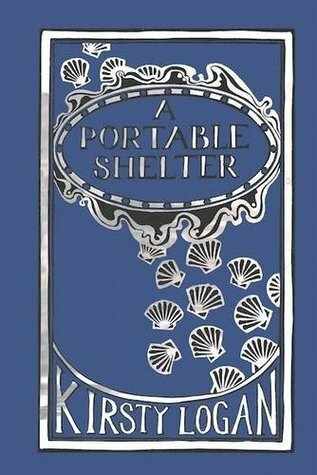 My appreciation and yearning for short story collections has been growing and growing over recent years, and after sadly being disappointed by Lucy Wood's Diving Belles earlier this year, a collection centered around Cornish folklore, I had hopes that A Portable Shelter, a collection this time centered around Scottish folklore, would satisfy my short story needs. Thankfully, it did! As with all short story collections, there were some stories I liked a lot more than others, though there weren't any I disliked, but what I loved about this collection was how the stories were all stories within one over-arching story of two women, Liska and Ruth, who are expecting their first child and are telling the unborn baby stories that seem to have some kind of basis in reality as they feature people the women know or know of through other people. It's such a clever way to help one story flow into the next, and it really pulled me through the book from story to story. There are tales of selkies, bears, dragons and people, each one playing with the blurred line between the mundane and the magical, how our lives are influenced by our stories and our stories are influenced by our lives. While the stories are true to an extent, I really enjoyed that we couldn't be sure how true they are - it was never clear if selkies and dragons actually exist in Ruth and Liska's Scotland or if they're metaphors for something else and I loved being able to decide that for myself. Logan's writing is lyrical and melancholic, yet hopeful. Some of the stories were heart-wrenchingly sad, but many more of them left me with the feeling that things can, and do, get better - not necessarily straight away, in fact never, really, straight away, but eventually they do, and eventually is enough. I'm really looking forward to reading more of Logan's work, particularly her debut collection, The Rental Heart and Other Fairytales. If you're a fan of fairy tales and folklore, or you're simply in the mood for a good short story collection, I definitely recommend picking this one up! Has IT reignited my love of horror?